A couple of days ago was a very special day. Many years back something of immense importance occurred and I popped out into this world. I’m so proud of this day that I tell each and every company that I come into contact with online through their forms pages. My favourite firms out there are the airlines, who want me to repeat my birth date each and every time I think of flying with them. Well, that special day which only comes once a year neared and I was pleasantly surprised to receive a host of name customized emails from businesses I have dealt with reminding me it was my birthday. I’d used Bahrain Air a couple of times, most recently at the end of May in 2012. I was impressed that they’d set up the feature (it isn’t too hard to automate the process if you have a good database and e-marketing tool) and that they’d not only sent it to my own email but also my wife’s email which I’d booked for the same trip. 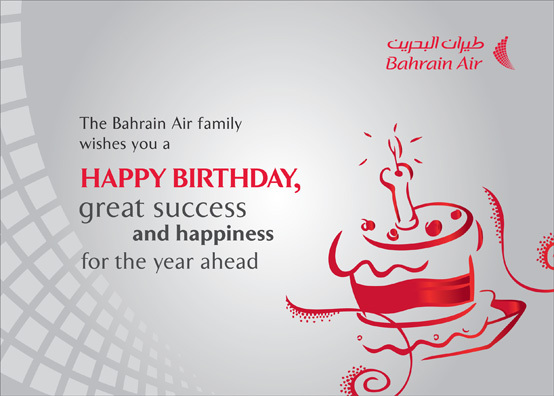 Thank you Bahrain Air for the kind thought! And then there was another airline, the airline which we were traveling on that very day. I first traveled on Emirates in 2003 and love the airline. However, did the good people remember this ground-breaking day? Unfortunately they didn’t, despite me reminding them every two weeks when I travel between Dubai and Bahrain. No card, no happy birthday. There was a boarding reminder however (does that count?). Technology is a wonderful business leveler. I was impressed by an airline that is low-cost and that has a fleet of four planes. In contrast Emirates has at least 190 planes and spends ridiculous sums on marketing every year, which Bahrain Air certainly does not. That Bahrain Air was able to make an impression at such a low cost says wonders for their marketing team, unlike the good people at Emirates. Now if only they were able to offer an added incentive to travel with them, a call to action such as a small discount, I’d probably have gone and booked immediately. As for Emirates that day, even the world-class persuasive powers of my wife weren’t enough to get us an upgrade (it’s his birthday she said with a stern voice). And to top it off, the in-flight entertainment system wasn’t working. Oh well, at least we were spared from the 15 minutes of advertising that the airline is now showing in-flight. This entry was posted in Bahrain, Marketing, Technology, United Arab Emirates and tagged Bahrain Air, birthday, e-marketing, e-marketing system, Emirates, Emirates Airline, marketing, technology by alexofarabia. Bookmark the permalink. Sad, Bahrain Air is no more. Very innovative marketing.